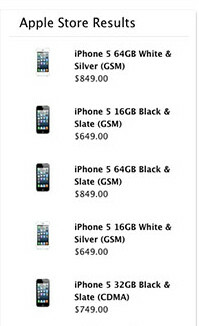 Are these the prices for the unlocked version of the Apple iPhone 5? Even though Apple has yet to announce pricing for its factory unlocked Apple iPhone 5 models which are expected in stores later this year, a simple search inquiry for "unlocked iPhone 5" at the Apple.com website revealed a heading called "Apple Store Results" with images of the device and pricing. The pricing, starting at $639, matches the pricing for unlocked models that are sold in Canada. The 16GB, 32GB and 64GB prices work out to $649, $749 and $849 respectively. While there is a chance that this is just a placeholder, Apple must have considered this a breach of some sorts since it has taken down the original images, replacing it with prices for unlocked Apple iPhone 4S and Apple iPhone 4 models. 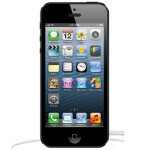 Once the Apple iPhone 5's global rollout is over, and the supply-demand equation is more in balance, Apple is expected to offer the factory unlocked variant of its latest smartphone in the United States. While Apple currently doesn't sell an unlocked version of the Apple iPhone 5 in the states, the CDMA model sold by Verizon was found to work on the GSM networks of AT&T and T-Mobile. In addition, the AT&T model can be unlocked, and with an iTunes reset and a new nano-SIM card, can work over T-Mobile's pipeline where over 1 million unlocked iPhone units already run. $649 for iPhone 5 vs. $349 for Nexus 4. Sure is expensive having that Apple logo on your phone. And I love that big beautiful screen, notification center, google now... ... Oh I forget that revolutionary PhotoSphere, sorry there are so many exciting features. Who cares about that apple partially ate by somebody else. Totally agree with you man. Android is always revolutionary and offers something with each new update as opposed to apple keep fixing "bugs". GO TEAM ANDROID!! Don't pretty much all high-end smartphones (except for the Nexus) have high price tags, not just the iPhone? Seems like every logo makes your phone more expensive. And the Nexus 4 is only a deal if you buy it retail. If it's true that companies like T-mobile will sell it for $200 w/o LTE then that would be a major rip-off. And aren't there 101 apps in both the Play Store and the App Store that have the same functions as Photo Sphere? Let's hold off on calling everything Google does revolutionary. 649$ for 16GB Model? FTW! its the double of Nexus 4 Give me 1 good reason why i shouldnt pay less and get alot more? There is no reasons except if you are a sheep haha,,,NEXUS ALL THE WAY!! it means you can use on any carrier in the world. they unlocked the LED display thats why its "Unlockled".. but still wrong bec. its LCD.. hey check it out.. This is daylight robbery. Making this phone costs no more than $200. Ain't paying thrice the price just for "quality"
The rest is for the "OS"
it is ! 1000000000000% lucky ! i wanna move to us ! Dude, dont make a phone that much of a serious deal. There are many other things you can focus on. I mean i know its nice to have high end new electronics to play with but paying over $1K is ridiculous and a complete waste of your hard earned money. Noob question: If you buy an unlocked phone and then put it on a network does it then become locked? If so how easy is it to unlock? I know if you buy a phone from a carrier they can unlock it for you after your contract is up, but since you aren't on a contract with an unlocked phone it seems like it shouldn't lock.